SMS, Voice & Email solutions for Debt Collection Agencies. By combining multiple communication strategies and automating processes, Esendex can help you improve customer interaction, increase successful collections, and reduce operating costs. DCAs can connect with more customers, more efficiently, using Esendex's intelligent multichannel communication platform. Agents can focus on customers who've responded to SMS and Voice messages rather than making resource-hungry outbound calls to customers. Scale up your debt collection business without needing to hire more staff, as Esendex's solutions drive inbound calls from customers. "15.2% of our customers who engaged via the Esendex Voice solution and 39% of customers who engaged via the Esendex SMS solution made a payment or agreed on a payment plan." Leverage our extensive experience working with DCAs. We can deliver a low-touch, effective and affordable communications strategy. 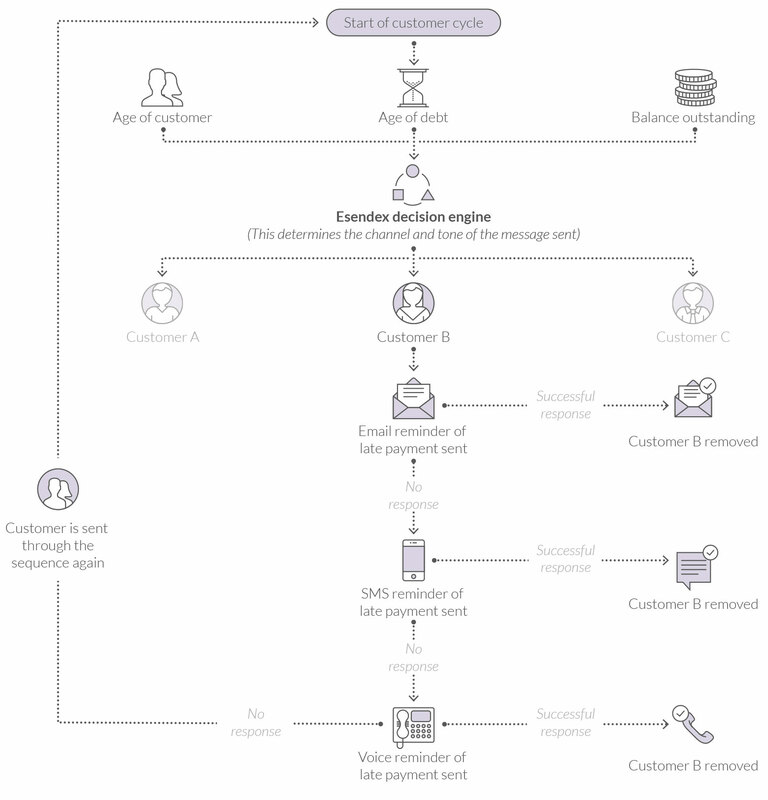 By automatically selecting the most successful communication method, and pulling out all undelivered messages, DCAs can connect with more customers, more efficiently. With Esendex, you can immediately scale up your debt collection business without needing to hire more staff, because we'll reduce the burden on your existing agents by driving inbound calls from customers. Agents focus on customers who've responded to SMS and Voice messages rather than making resource-hungry outbound calls to customers. We have a wealth of experience in the debt collection sector, and can pass on that knowledge to you through our Professional Services team. They'll work with you to create a low-touch, effective and affordable communications strategy. We're ISO 27001 accredited, and ensure that all of our solutions meet the FCA and Ofcom requirements regarding the fair treatment of customers. Learn more about our SMS | Voice | Mobile Web solutions.